I was at Exclusive Books yesterday to pick up a book I had ordered. It is a little book – only 40 pages long and fits neatly into a backpack pocket. This booklet is going to make walks with Tim and his mates much more fun and a little more entertaining. 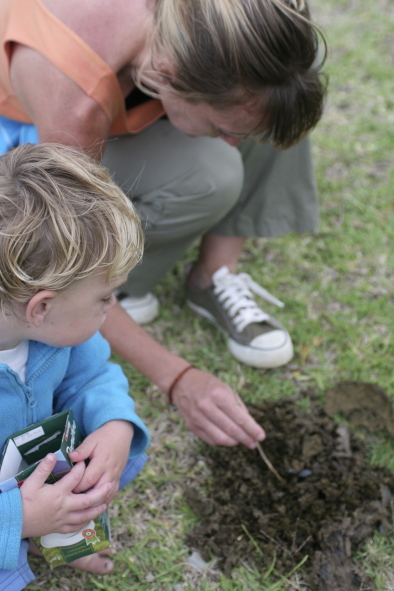 Now we have no excuses when we come across a pile of twig or shell encrusted turds and glibly say “probably mongoose….maybe otter….?”. Now we have to look it up, measure it and dissect away merrily. We even have a full blown chart and key with avge width, length, and whether it contains bones, hair, millipedes, crabs, scales, sand, grass, seeds etc! We have to consider whether the turds have been dispatched onto an elevated area, buried or broken…..all important bits of the poo puzzle, it seems. The author’s end note is brilliant and so very true. Every now and again I get the chance to head out into the wilderness and taste heaven..this weekend was no exception. Tim was well taken care of (with the best grandparents in the world!! )…and I was free as a bird and able to soar for hours in the mountains above Greyton. 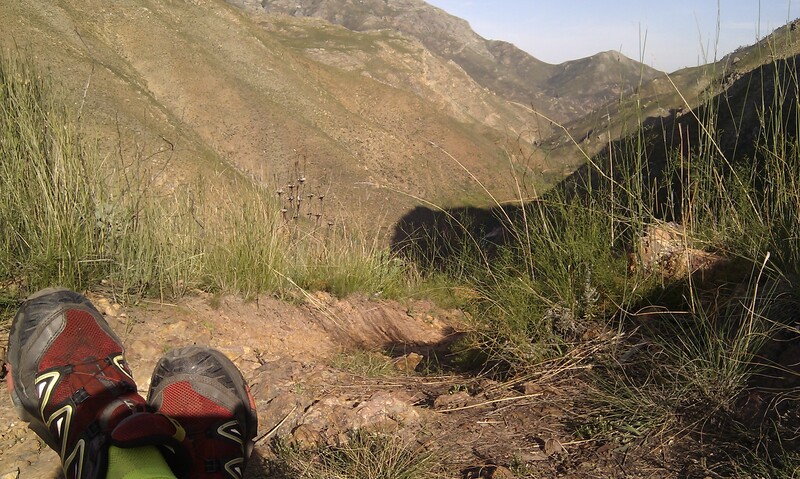 I ran the Greyton-McGregor trail route (out and back) – which one way, is roughly 14 kays worth of winding-up-and-down gravel strewn single track. The trail ultimately spits hikers out at a hut overlooking the McGregor valley. I had to bag about 5-6 hours on Saturday (‘had to’ based on a training schedule for an ultra trail race that looms large)..so I opted to head McGregor-wards. Once I reached the hut, I added an extra, easy 12 kays into the mix. This is a photo of me and my trusty ‘Wings’ taking a short break looking back on the home stretch.. I did not see a single human on that stretch….was just the mountain and I. Complete and utter bliss. 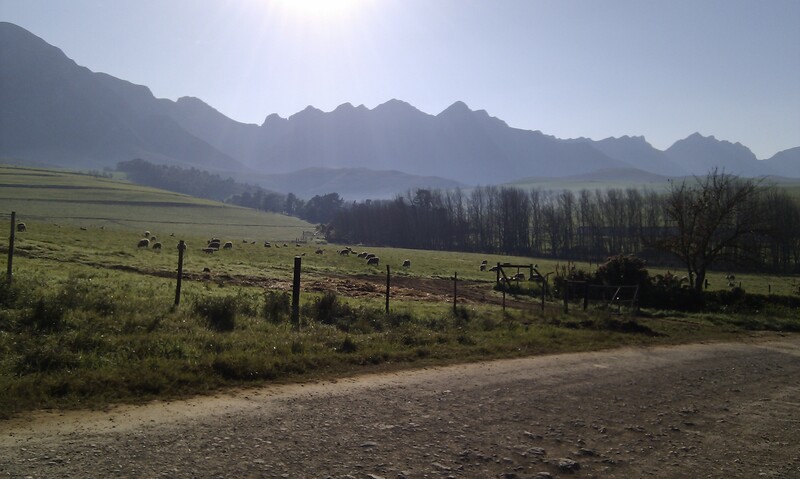 Today I did another little 2 hour jaunt out into the Greyton farmlands…this photo speaks volumes I think. The place oozes serenity from every pore..the soft light, happy lambs, rolling green hills and blue mountains behind. When I took this photo, I had a handful of blue crane gurgling in the sky above, a lone coucal bubbling away in the wetlands below, and just minutes before, had heard two Fish Eagle calling in the valley. Part 1: “Just over tha’ wee hill”, said the funny man in a skirt..